Photograph of an excavated section, showing great earthenware jars, at Brahmanabad in the Hyderabad District of Sind in Pakistan, taken by Henry Cousens in 1896-7. This is a close view of an excavated section, with embedded jars and an Indian man seated in the foreground to indicate scale. 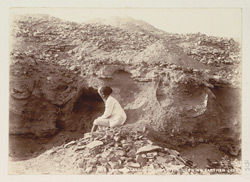 Cousens wrote in the Progress Report of the Archaeological Survey of Western India, 1897, "In the sections as shewn in the sides of the pits below...are seen, embedded, immense numbers of great earthen jars very much in the shape of country flower pots, measuring 3' to 3' 6" across the mouth and 2' 6" deep. These are below the foundations of the walls, the latter in many cases cutting through them. These and other signs shew unmistakenly that we have the ruins of two distinct cities..."